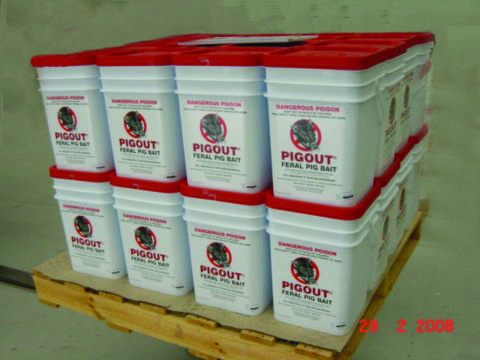 PigOut® Feral Pig Bait was the first commercial product of the IA CRC – the result of several years’ collaborative research and development effort by Animal Control Technologies Australia (ACTA), Meat and Livestock Australia (MLA) and the National Feral Animal Control Program of the former Bureau of Rural Sciences through the Invasive Animals CRC. Many state and territory government agencies concerned about feral pig management also assisted in product trials. PigOut® baits contain 72mg of 1080 toxin and are designed to break down over time with the action of moulds and bacteria in the soil. PIGOUT® baits are designed to digest quickly in the stomach of the feral pig, and are less prone to regurgitation than whole meat baits. PigOut® baits come under the restrictions of 1080. Where can I purchase the baits?